Seafood is not my favorite type of food, but I love me some salmon! This easy salmon recipe is packed with flavor and is perfect as an appetizer or a main course! It’s one of my favorite easy home cooked recipes. This firecracker salmon recipe was inspired by a recent date night that my husband and I went on. 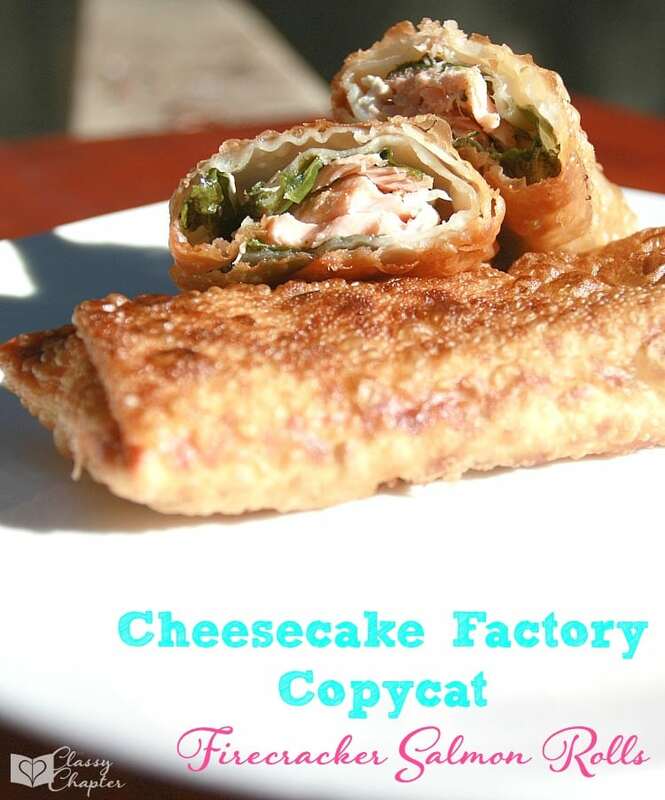 We were eating at The Cheesecake Factory and ordered a similar version of this recipe as an appetizer. My husband who can not stand salmon actually gave it a try and loved it! 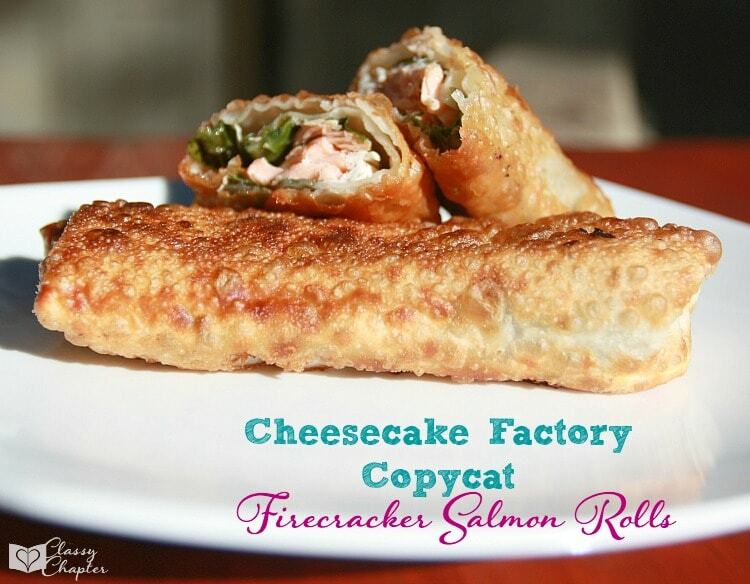 Don’t let the name firecracker salmon rolls throw you off, you’ll love these even if you don’t enjoy spicy food. The actual roll is not spicy, it’s the sauce that gives it the spice. If you aren’t a fan of spicy forgo the sauce or make your own version. Start by preheating your oven to 425 degrees. Sprinkle some salt and pepper on your salmon filet and place in a lightly greased baking dish. Cook the salmon filet for 4 to 6 minutes per half inch. Once your salmon flakes easily, it’s ready to be taken out of the oven. Let your salmon cool slightly while you gather the egg roll wrappers and spinach. Once you have all of your egg rolls stuffed and rolled it’s time to start frying them! Place enough oil in a deep pan to cover the bottom. Gently place egg rolls in pan, turning occasionally until the entire roll is golden brown. Place the egg rolls on paper towels to soak up any excess oil. These rolls go great with white rice. To make the sauce, you’ll mix together the Asian Chili Sauce, honey and soy sauce in a medium-size bowl. You can serve the sauce cold or heat it up and serve warm. 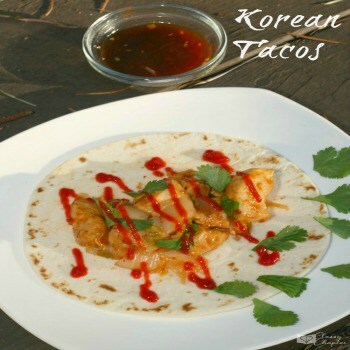 If you enjoyed this recipe, be sure to follow me on Pinterest and check out the Korean Taco recipe below. These look amazing! I’ve never had a salmon egg roll, but I do LOVE egg rolls in general. I’ll definitely be trying this. I love this idea! Thanks for sharing at Foodie Friends Friday! Oh my, these look so delicious! Next time I buy salmon will be trying these. Oh I bet chicken or shrimp would be really good in this! I love that idea. I like salmon a lot but never really cook with it. These look delicious. Thanks for linking up to Sweet and Savoury Sunday, stop by and link up again. Have a great day! !